Sadly, the latest blog posts all seem to be about the inner workings of the site. You may have noticed down time for a day or two — our MySQL server crashed for an unknown reason; I was on holiday and didn’t notice. My apologies for the inconvenience. For those who care about such things, the details of what happened will unfold on the forum as I uncover them. UPDATE: If you’re seeing this, you’re at our new home! You may notice that your address bar contains ‘74.126.25.104’ instead of ‘brassgoggles.co.uk'; fret not, that should be fixed in a few days (it’s a side effect of moving to the new host). My apologies for the short notice: we’d intended to manage this a little more slowly, but were caught off guard by a particular requirement of our upgrade process that I hadn’t planned for. At this time, the comments to the blog are disabled, and the forum has been taken off-line. This is to prevent data loss as we make the move. This is no longer true. Comment and forum-ify away! This move should go much more smoothly than the last round, since we’re staying with the same hosting company, and just moving to a bigger server. Thanks to everyone who has donated so far, you’ve made this move possible for at least the next few months. Please continue to support our plan to be funded for 5 years by following the Amazon badge found in the Donate area of the right column (waaaay at the bottom). Soon, soon, Now, we will no longer have our 503 errors that have plauged the forum of late! (fingers firmly crossed). Clive Batkin is a new (and hopefully upcoming) steampunk artist of whom we proudly display two perfectly stylish creations here. 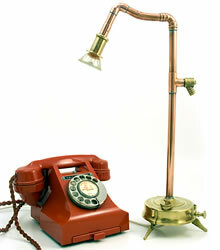 The first image depicts a steampunk desk lamp called “The Optimus” by Mr Batkin, after the Swedish-made brass stove that forms the base of the lamp. 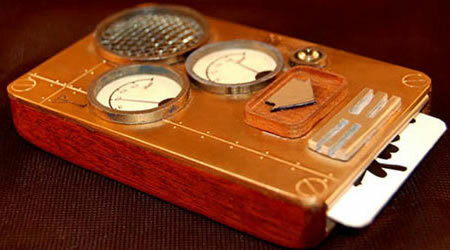 Simple and beautiful, “The Optimus” should perfectly complement any steampunk enthusiast’s desk–and we want one too! 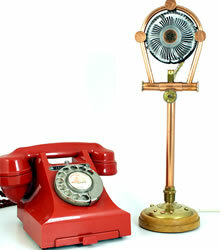 Depicted besides the lamp is a steampunk desk fan created in similar style. Mr Batkin explains that, “construction centered around lots of copper pipe,” with “some of the beautiful newly designed UK one penny coins” used as end caps and decoration, “and lots of random brass/copper bits and pieces here and there.” The result makes for an elegance pure and shining that represents the work of an undeniable new voice in steampunk style. The device was created by a Mr Arthur Schmitt. A new steampunk blog popped up fairly recently. Steampunk Pics provides the visitor with charming collection of steampunk imagery, always within a certain scope, be it “Steampunk Toys” or “Steampunk Star Wars” or “Zeppelins” or “Clockworks”. As the author, Mr Tomasz Armatowski puts it: “I’m on a quest, browsing through the Internet in search of pictures.” A quest certainly successful, we dare say, for the blog is regularly updated to provide the steampunk enthusiast with a new selection of wonderful depictions! Originally an entry in Customcon XXI. The line continues the idea of blending original Star Wars elements and industrial aesthetics. Mr Andy Miller was so inspired by the “Steampunk Ornithopter” we wrote about last October, that he decided to built one himself! 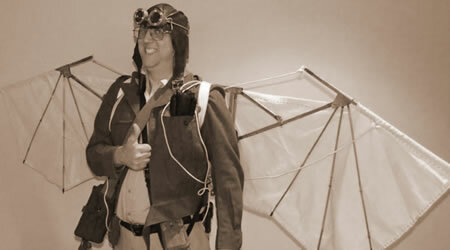 Mr Miller crafted the wings out of a variety of parts, the frames made of bamboo sticks, the cloth being a recycled tablecloth, and the steam engine a copy machine toner cartridge, with a tube from a broken mop for the exhaust pipe! With matching leather aviator helmet and goggles, it makes for a charming outfit indeed! For more information and pictures, click here. “Our goal is to design items of wonder that are as they would have been in The Time That Never Happened.” That is the motto of Steam Gear Lab, a small company that produces props and makeup effects and provides production design for film, stage and television. All their productions are hand-crafted by two infamous gentlemen, The Notorious Dr. Grymm and Professor Gauthier, Sociologist of the Strange. We present here a modest selection of their fine work. Be sure to visit their Website for more! 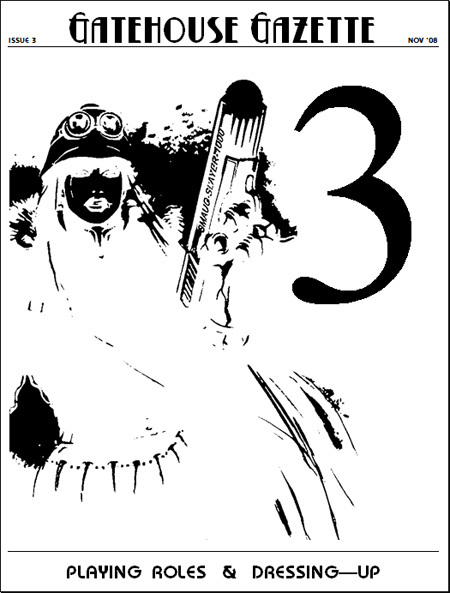 Steampunk is all about “Playing Roles & Dressing-Up” with the third and holiday issue of the Gatehouse Gazette. Read about the most stylish history maker, Beau Brummell, from Mr James Roberts or discover the glory of the Venetian Carnival in an article by Mr Joost van Ekris. Learn the life story of the first steampunk musician from the man behind Vernian Process himself, Mr Joshua Pfeiffer, and let Mr “Piecraft” teach you about the early history of the dieselpunk genre with the films Metropolis and Man With A Movie Camera. Furthermore, we have an article about steampunk makeup by Miss Bérengère Couneson, two articles about steampunk role-playing as well as a Steampunk Wardrobe column about the “Airship Pirate” look all by Miss Hilde Heyvaert, reviews of Unhallowed Metropolis, Scarlet Traces and BioShock, plus a column by Professor Delphinius J.C. Tucker. Click here to download and read it!